because of the old fashioned tie closure, i recommend these bibs for decorative purposes only. i'm framing two to put in my soon-to-be-born daughter's nursery and they look smashing! if you do want to use it as a functional bib, please do not leave the child unattended while the bib is tied on. i'm still going to work on a snap closure pattern (cause suzy, i've had one to many mishaps with velcro in the wash as well!) but every now and then, i may just need to indulge my love of this style and hope that people use them responsibly. also, there's less than a week left in may so if you've been coveting a windsee, grab one while they're still on sale! Sound reasoning all round, I say! And as for velcro in the wash - just stick the pieces together before you throw the item in the machine, and it should be fine - no sticking to other bits of clothing! I agree with Melanie about the common sense part of the bib scenario. Babies shouldn't be left unattended in a high chair no matter what they are wearing. I had no idea this was an issue, all the bibs I wore as a child had ties and I'm still here! Also, I like that ties are infinitely adjustable, and therefore last longer requiring less baby paraphernalia. That being said, I think the disclaimer you wrote is well stated and will help non-parent gift givers make a good choice. True, babies who are eating shouldn't be left alone, wether they are wearing a bib, in a high chair, on the ground,..you should always be attentive with the little ones! And for your windsees I really like them!! I nearly left a comment on your last bib post, but didn't feel like stirring up any controversy. But I'm in favor of common sense, too, and will have no qualms using a tie bib with my kid as long as I'm around. Parents have enough to be scared about, I'm not adding tie bibs to my list. 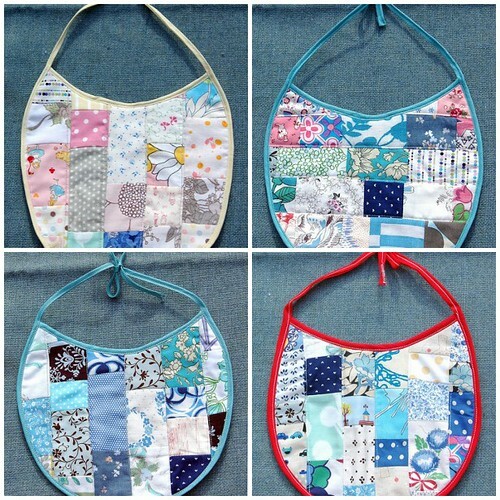 That said, I should note that your patchwork bibs are really, really cute! re snaps v tie closure... ties look great, but I find snaps easier to deal with. I use a snap press (I have a machine from snaps australia) - a great investment, and you can choose from lots of colours. Never mind the debate, those are the cutest bibs I've ever seen! Actually, I'll put my two cents worth in after all: bibs with velcro have a very annoying tendancy to make other items in the same wash get fuzzy patches on them. Just so you know! to pretty much everything in life. What a great idea to frame them. I'd love to see a pic if you have time! I love those bibs Leslie. I guess the tie issue is relevant to people with babies like mine were who spew incessantly, they tend to wear bibs pretty much all the time. In fact I practically wore a bib for the first 12 months with my two. They really were spewy. And there's the dribbly teething stages too. But of course common sense applies and I never left them unattended in a tie on bib.